Thanks to the courtesy of another Consultant for creating this complete list of retiring items effective Jan 31st or while supplies last. Contact me or go to my website here to order items. With the receipt of the much anticipated Spring/Summer 2012 Catalog, I want to extend a big Thank you to fellow Consultant - Kathleen Stoppelmoor for taking the time to create the following list and sharing it with us! The following items are not in the new catalog, so if you see something you want, need, must have - then you better get them before the new catalog goes live on Feb 1st. Contact me to order your items, or go to my website here to order. This month and year is almost over! So hard to believe! Below is the layout my monthly class made using Believe papers. I had also found a ribbon weaving technique on a blog, could not tell you where I found it now unfortunately! So I taught them that technique and we made the wreaths shown in the second picture. 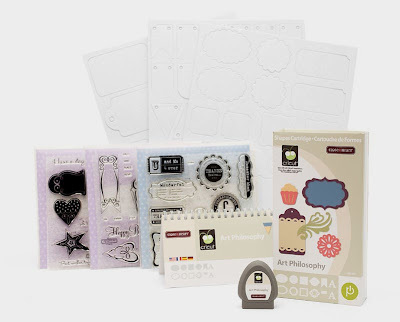 Blog Candy at The Stamping Boutique! 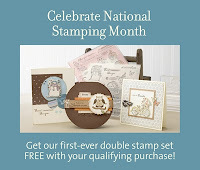 The Stamping Boutique is offering blog candy to one lucky follower! It's valued at over $100.00 and includes designer papers, rubons, embellishments, red rubber stamps from TSB and the list goes on and on. Check out some wonderful DIY home decor items that CTMH Corporate office has created using our products! Ah, home sweet home, where we get to decorate to our heart’s delight! Add these beautiful DIY dècor pieces to your home to live inspired every day. We’ve chosen a sleek color scheme of Grey Flannel, Black, and White Daisy, with a pop of Pear, and we used the graphic flowers from the My Acrylix® Dreamin’ Workshop set to add subtle texture to the White Daisy paper in the desk calendar and art canvas. Here are a few hints for you as you create these chic projects. Create the triangular base of this calendar by folding a 12" × 12" piece of chipboard at the 3" and 7 1/2" marks. 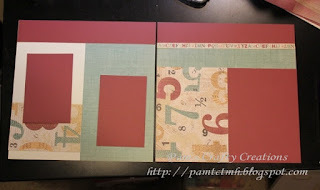 Cut twelve 3 1/2" scalloped squares from Pear cardstock using the shape on the Cricut® Art Philosophy cartridge (Z1686) and sponge the edges with Pear ink. Cut twelve 3 1/2" squares from Grey Flannel cardstock and sponge edges with Grey Flannel ink. Back each month and date tile with the 24 pieces of cardstock and then punch a hole in the top for easy hanging. 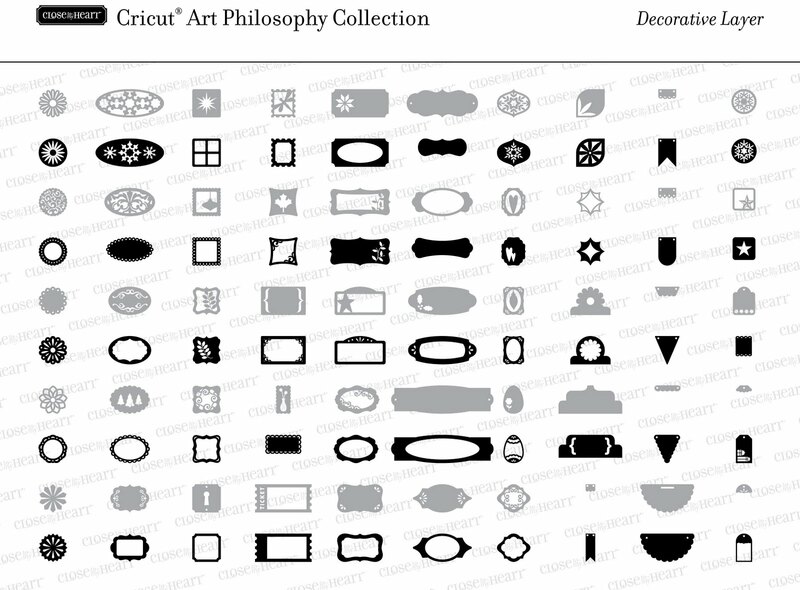 Choose a few simple icon stamps to fill in empty areas. 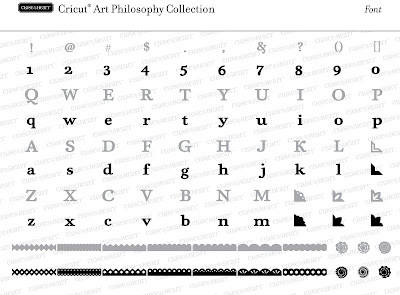 Play around with the placement and spacing of the letters and icons before stamping. 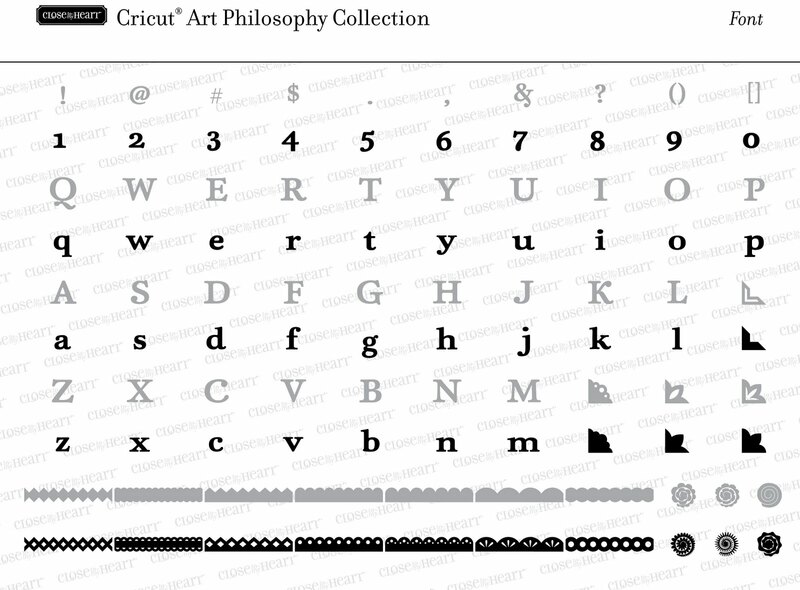 Stamp the words and icons with black StazOn® ink. Attach the finished cardstock piece using a thin coat of Mod Podge applied to the canvas. 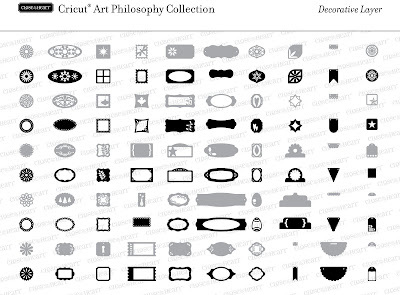 Cut out 130 2" scalloped circles from Grey Flannel cardstock using the shape on the Cricut® Art Philosophy cartridge (Z1686) or by punching the circles using the 2" scallop circle punch (Z1392). Staple the circles together in stacks of five. Squeeze and scrunch the edges then adhere two stapled sets together on the flat sides to create a spherical shape. Sponge edges with Grey Flannel ink if desired. Place the finished flowers inside a glass carafe or vase. Wrap Sweet Leaf ribbon from the Designer Ribbon green collection (Z1616) around the neck of the vase to accent. Here is another class layout. This one was just from earlier this week. We started a new rotation on Tuesday night. It was a larger group of ladies this time, some were from the last rotation continuing on, and some were new people that I met either at the Craft Fair or the Crop for the Cure. It was a fun night! Below is the layout they made from class. I love this time of the year all of the changing colors & the cooler weather! Part of the accents were inspired by another talented Consultant Carol Labuski. I can't get into this paper pack being used for Halloween, so as you've seen in another post, I like to use it for Fall! This first picture shows the layout before pictures and before I was done embellishing it. This shows my layout with pictures added. I took pictures around town of the changing colors. I wanted one large picture for the left page, but I decided to use 2 pictures instead. These were taken up on the rims by the airport in Billings, looking out across the town as the leaves are changing. New Items added to "While Supplies Last"
Have you been to my website lately? Well I just checked it out today and Corporate has added a few more items to our Clearance - While Supplies Last section of our sites. 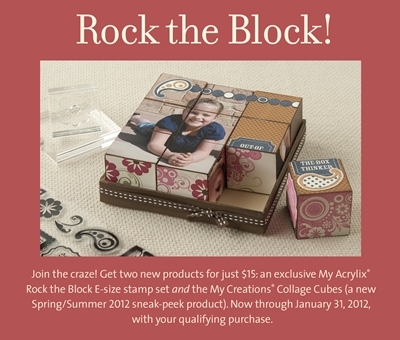 There are some of the retired My Acrylix Blocks on there, also Miracle & Bliss paper packs for $5 & $3!! Go here to get your deals before they are gone! Do you love Close to my Heart products? Have you considered signing up in the past? Maybe you want to start your own business to earn your own money or help the family out with some bills or to plan a family vacation. Or would just like to sign up as a hobbiest to get the discount? 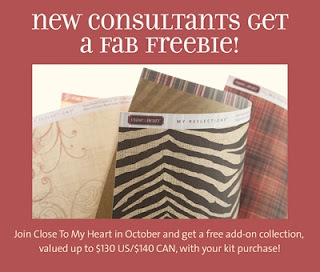 Well now is your time, because when you sign up to be a Consultant in October you get to pick any one of the Add-On Collections for Free!! Yes, you heard that right! The New Consultant Kit is only $99, over $280 retail value. Each of our three add-on collections is priced at $40 and has a retail value of $80, if you were to pick the Studio J add-on collection it is valued at over $130, so this is an incredible deal! Contact me this month with any questions you may have about joining this wonderful company! Wow, where did September go? I can't believe it will be October tomorrow. I haven't been too crafty lately short of my monthly class last week. My hubby and I started a pretty big landscaping project in our backyard, so that has been taking up any and all free time recently. We have over an acre and we have a small stream that runs through it. So we have finally tackled the lining & rocking it project. We hope to get it finished this weekend, YEA!! Then I can get back to some crafty stuff. I did want to mention with October just around the corner, as most of you know it is Breast Cancer Awareness Month. If you are local to the Billings area, then I would love for you to join me as I help support Billings Clinic's Crop for the Cure. It will be held on Saturday October 8th from 9am - 7pm. I have signed up for their crop and will be one of the scrapbooking & stamping vendors there. You can check it out and get signed up here. 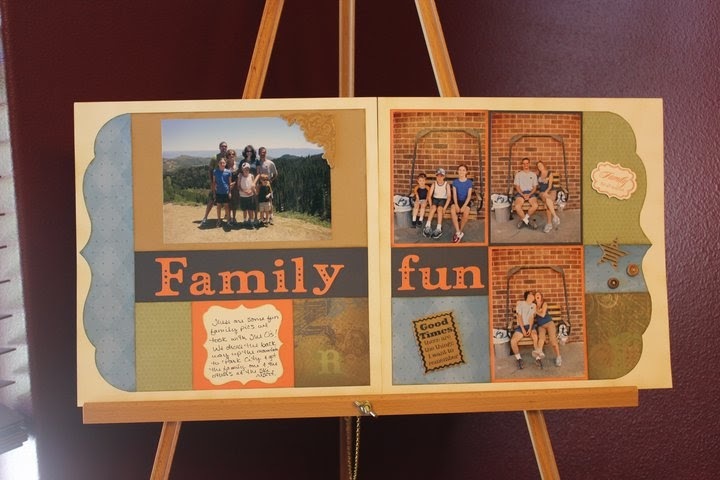 You will have the chance to win door prizes, participate in a Cricut raffle, take part in special scrapbooking classes, and have the opportunity to participate in fun scrapbooking make-and-takes! 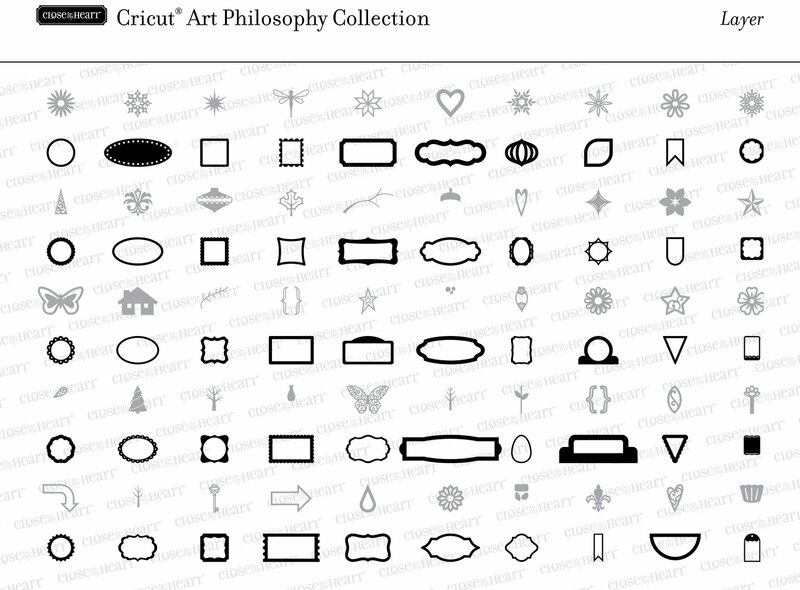 I will have our new Cricut Art Philosophy cartridge with me to show it off and all the fun things that can be made with it!! Well our first load of river rock just arrived, I'm off to do some physical labor! Hope everyone has a great Friday & wonderful weekend! I've seen different blog awards on blogs that I follow or have viewed and never knew what they were or how they got them. Well, I was quite excited to see in an email that I had received one! Thanks so much to Amy McVey for this award!! You can check out Amy's awesome blog here, if you like her creativity as much as I do make sure and follow it! Now it is my turn to pass this award on to five of my favorite blogs with less than 200 followers. If you like their blogs, remember to "Follow" them. The hope is to help out some of my fellow bloggers, and get a few more followers of my own. If you see your name/blog listed here, please pass the award on to 5 more blogs that have less than 200 followers. Here are 5 of my favorite blogs. I hope you like them as much as I do! And remember to follow them if so! I just found this video and thought I would share it, for all Cricut users, new and old that might not have known this little trick already. Cricut Dan explains why you might want to prep a cutting mat before using it the first time. My 1st Craft Fair went pretty good, after the rain cleared out! I was one of the 14 outside vendors. After watching the weather all week and it initially just showed a 20% chance of rain, my hopes were high for great weather. Then Friday's forecast was rain Saturday morning. Yep, I have my car loaded with tables & a canopy tent all ready to go, and off I go (with my hubby to help me) set up, in the RAIN! I was feeling pretty bummed thinking who will want to walk around in the rain to visit vendor booths? But after about an hour, the rain tapered off and the blue skies and sunshine showed up. It was a nice day and I met some really great ladies that share the love of crafting like I do! They showed interest in either joining my monthly class or having a home gathering party. So I'm hoping it will work out that they can join us! Next, drumroll please... The winner of my Door Prize Drawing was Shirley Steinert!! Congrats Shirley!! I'll get your prize in the mail to you! Fear not, if you entered my Door Prize Drawing but you're not Shirley, you will be receiving a little something in the mail from me also! I hope everyone is having a wonderful Fall day like I am! You know that favorite sweatshirt I posted about a few days ago, well that's what I'm wearing right now as I'm busy getting things ready for my 1st Craft Fair. It was 45 degrees when I took my boys to school this morning, brrr. I'm super excited and a little nervous too about Saturday. 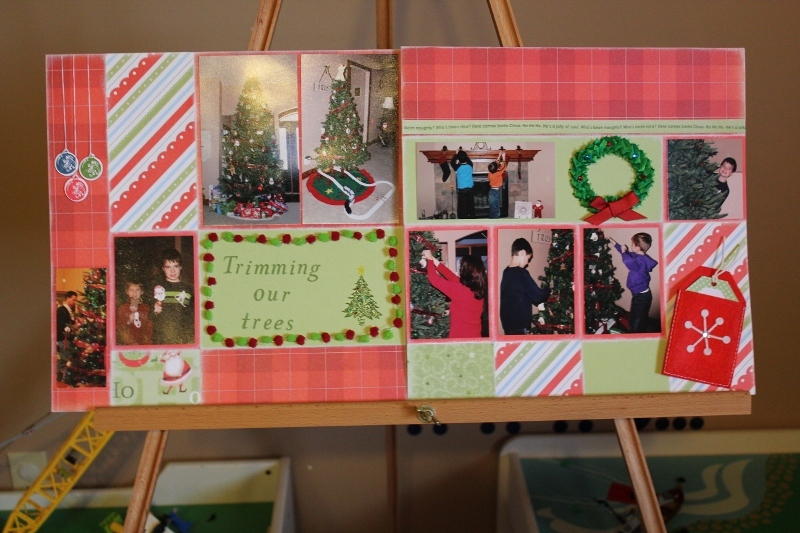 I signed up to participate in a First Annual Decor & Craft Fair at The Crossings. So if you are local and/or in Laurel, come by and see me from 9am - 3pm! There will be lots of vendors there, last count was over 30, including PartyLite, Pampered Chef, Scentsy, Tupperware, Mary Kay, Miche Bags, Lia Sophia, hand made jewelry, crocheted items, baked goods, kitchen accessories and many more! Here is a glimpse at one item I'm working on to have out on my tables. The Memory Game made into a Countdown to Christmas box. I know my boys will have fun with it this year! Yes, it seems a little early to be doing something Christmas-y but it will be here in just 3 short months! Have you been over to my CTMH site lately?? Well if not, you need to go check out the new "While Supplies Last" clearance items that were just added. 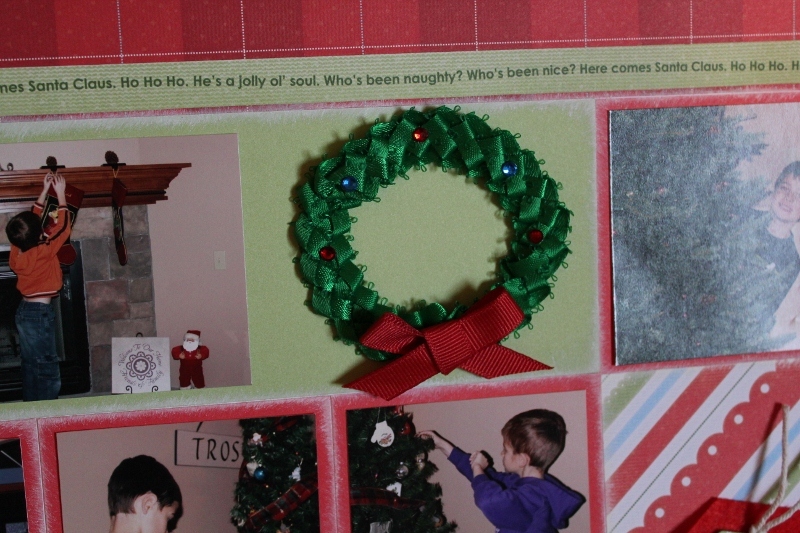 There are Level 1 Kits, Irresistibles Die-Cuts, Rub-ons, Dimensional Elements Chipboard, Kraft borders, etc. Get yours while you still can, because once they are gone, they're gone! Go here. I just love this stamp set! Could it be because I love Fall? Yep, thinking so! This is a video made by CTMH Corporate using the So Grateful stamp set and the base and shade technique. I just wanted to share this picture of my favorite sweatshirt as the cooler weather starts to make its way upon us. If you are a close friend of mine, you have seen me wear this quite a few times! If you are a fellow CTMH Consultant and have seen me post on the message boards, then you have seen it as part of my signature at the bottom of my posts. I've had this for quite a while now and it is one of those that will be worn until it has a hole and is pretty ratty looking. You know like those comfortable shirts our husbands have, worn thin or have holes in them, but they do NOT want us to get rid of them. That is this sweatshirt for me! No where does it have holes or thin spots, but it does have a few ink stains on it, imagine that! But I forsee it being that nasty old shirt that I won't part with down the line when it has seen better days! It just fits me, ya know! Hope you are having a great Thursday! Sharin' the Love in September! You've seen I've been participating in some Scrapbook Challenges lately. Well now an Upline has issued a Challenge to her Consultants, and I have to participate in that too! 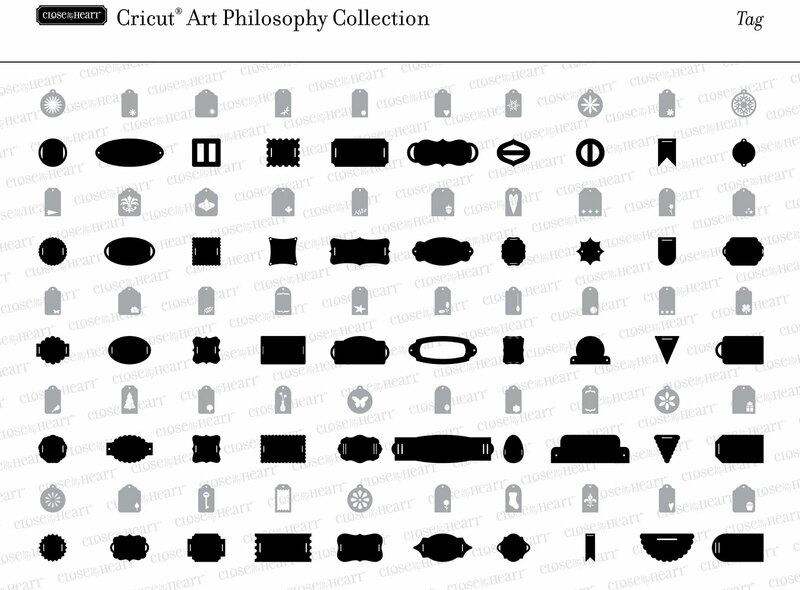 For every CTMH Cricut Art Philosophy Collection we sell, our name goes into a drawing to win a prize at the end of September. So what does this mean for you?? 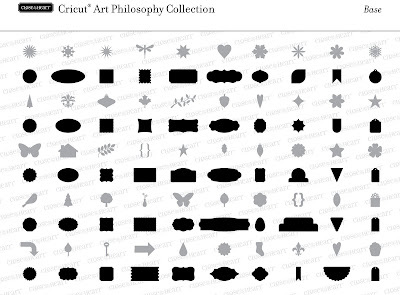 If you purchase the Cricut Art Philosophy Collection (Item #Z1686) between now and Sept 30th from me, as part of the "Celebrate National Stamping Month" you will receive the Pair-a-Phrase Double Stamp Set for free. ALSO, you will get to choose any C-size Stamp Set you want for FREE! This shows both D-size stamp sets that make up Pair-a-Phrase. Super cute! So if you've been on the fence about buying this collection, let me just recap all you would receive for just $99 plus shipping! Contact me if you would like to take advantage of this offer! This is another layout I created for the Scrapbook Challenge #121. Using Magic - Crystal Ball. Until next post... Happy Craftin'! I found another sketch challenge site - Sassy Lil' Sketches. You can check them out here. This is the layout I created for their sketch, August Week 4 Layout Sketch. I knew almost instantly that I would be using Typeset papers and doing the picture I took of my boys the morning of their first day of school. I hope you like my creation! Supplies used shown below. Supplies﻿ used all Close to my Heart, unless otherwise noted. Here is the sketch that I was working from. 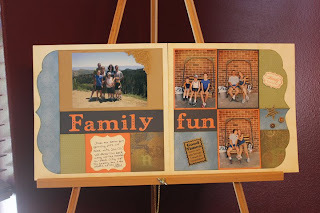 There is a Scrapbook Challenge that was started on the CTMH Message Board by Helen Onulak. You can check out her blog for previous challenges at http://www.hookedonstamping.com/. I have admired her work as well as that of the other Consultant's that posted their work. Helen has a medical condition that is not allowing her to do the challenge temporarily, so another wonderful Consultant, Carol Labuski has stepped up to continue the challenges. You can check out Carol's blog at http://iluv2cre84u.blogspot.com/. Up until now, I hadn't participated in these challenges mainly because I didn't seem to have time. Now that my boys are both in school I am getting some more quiet crafting time during the day, so this is the layout I created for SC120 - Scrapbook Challenge #120. I hope you like it and it might show you the versatility of the Mischief paper pack, if you are locked into it being only for Halloween. 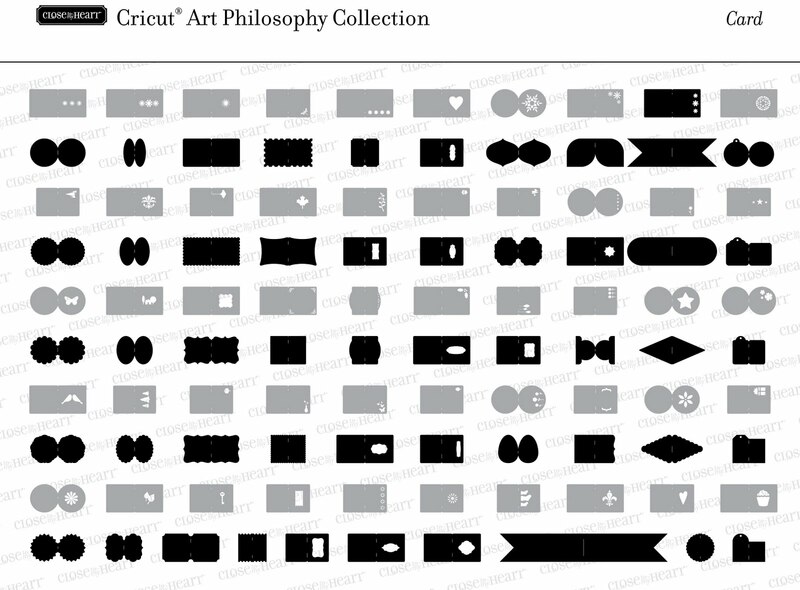 I just discovered another wonderful video review of the new CTMH Cricut Art Philosophy that I thought you might like to see! 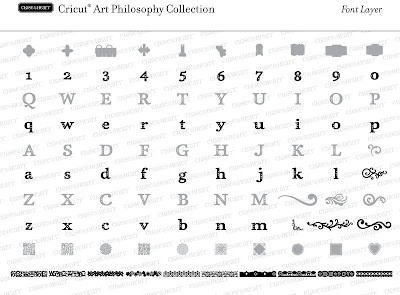 To get your very own Cricut Bundle, go here. Until next post, have a great Monday! I just discovered that there is a Studio J Blog! Need some ideas or info on how to use Studio J? Hop on over to the blog to find this out! 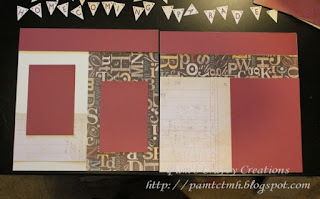 Monthly Class Layout using Lucky & Cricut! Last night I held my monthly scrapbooking class with a wonderful group of ladies. It is always such fun to get together with them! I let my Hostess of the month pick which paper pack they would like to use and this month's picked Lucky. 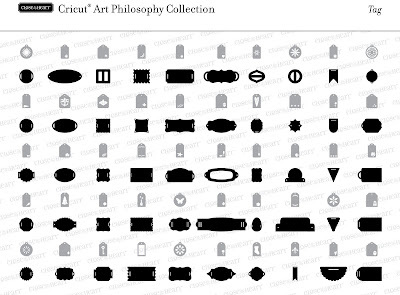 With the use of our new Art Philosophy Cricut cartridge to cut so many fun things on the layout & I only had one stamped item, I feel almost as though I cheated on these layouts! They came together so quickly & easily! But I think the layout turned out cute and so did my ladies and that's what counts to me! Here is the layout. Let me know if you have any questions or would like to purchase any of the items used. 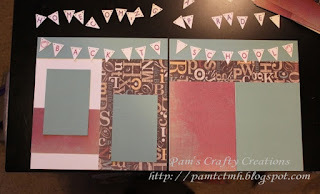 Until next post... happy scrappin'! 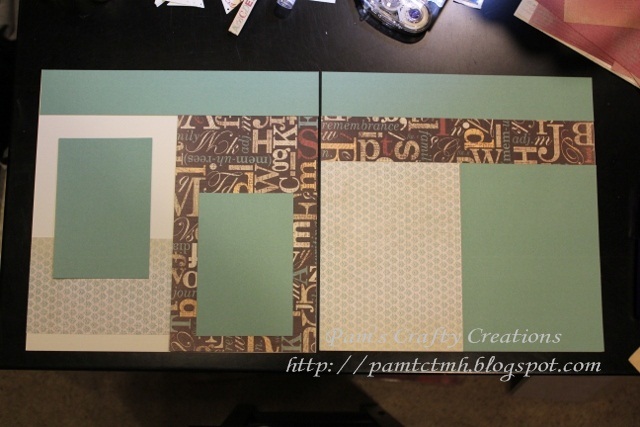 This is the layout I made at Convention during one of our Create & Take classes using Roxie papers. I'm a little behind on getting it posted. And I still need to journal my "10 Things" on the tags. I know they will be things like "You treat me like a princess!" and other mushy stuff like that, I just haven't written them down yet! 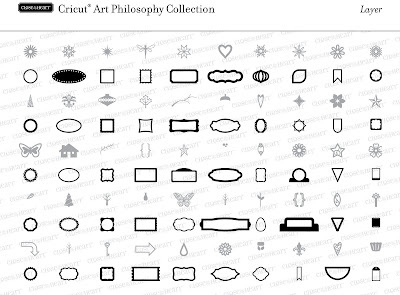 Here are all 700 of the images on Close to my Heart’s Art Philosophy Cricut Cartridge. I have to thank Lisa Stenz, a fellow CTMH Consultant for sharing all of these images! 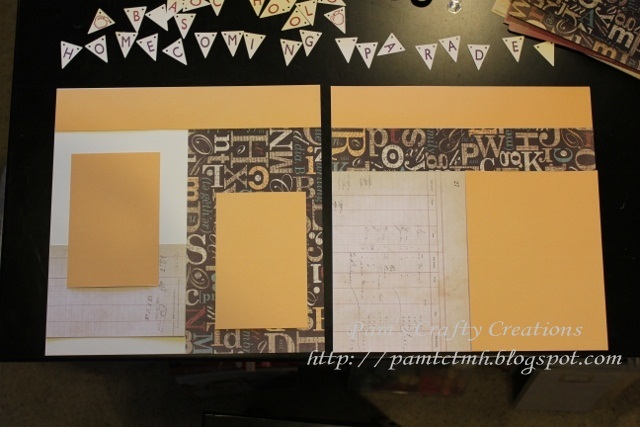 With the Cricut Expression using the 12"x12" mat you can cut almost every image in 47 different sizes! That’s almost 33,000 options, WOW! Can you imagine how much 33,000 punches would cost? Not to mention the storage space you’d need? I don't know about anyone else, but my craft room is already so packed I don't need anymore punches. I love that my new cartridge doesn't take up much space! 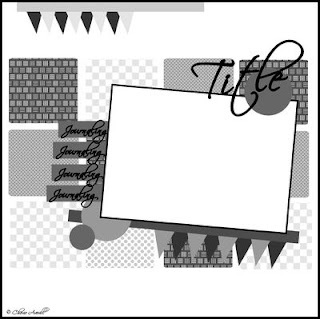 Check out all of these great shapes including boxes, bags, tags, banners, borders, a font, cards, envelopes, flowers (3-D and flat), and all of the incredible images that coordinate with CTMH stamp sets! 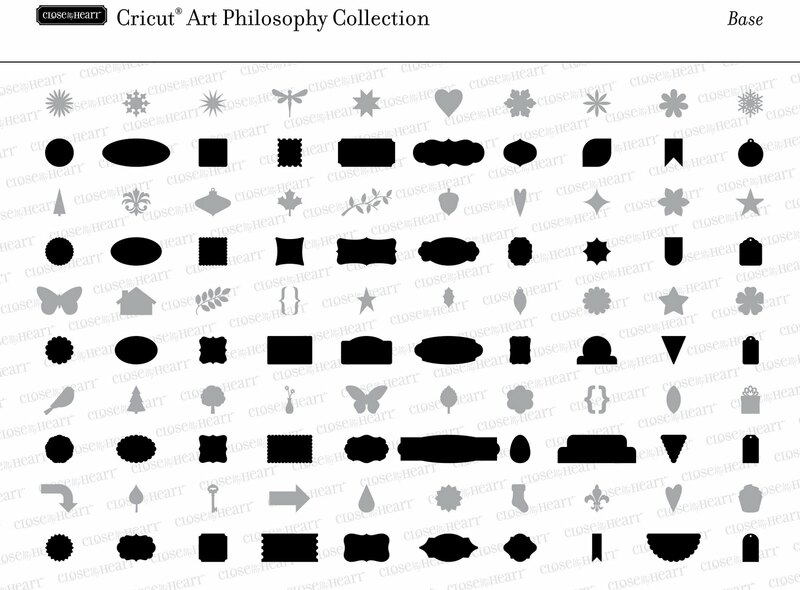 When you purchase the Cricut Art Philosophy cartridge, you’ll also receive three exclusive D-size stamp sets and three sets of Dimensional Elements (chipboard) designed to perfectly coordinate with images on the cartridge. That’s a retail value of over $120 for just for $99! Remember all of those punches you would have to buy otherwise?? This really is a great deal! Go here to order your collection today! Plus, when you order a minimum of $50 this month, and get the cute August Stamp of the Month - Wicked for only $5, you will also get a FREE A sized alphabet stamp set called A Typeface. CTMH has posted another wonderful video using the new Art Philosophy Cricut cartridge & the new My Acrylix® Hooray Bouquet stamp set. That is another stamp set I won at Convention, YEA! I really need to go create this page! The new Idea Book is officially live! Contact me to get your copy! Lots of wonderful new products, lower stamp prices & the new exclusive CTMH Cricut Cartridge Art Philosophy! I know my last post was about the Cricut "Hello Thursday" email that I received and a link to check it out on the Cricut site. Well I also stumbled upon a video review of the cartridge made by a fellow CTMH Consultant, Mandy Leahy. You should really check out her video. 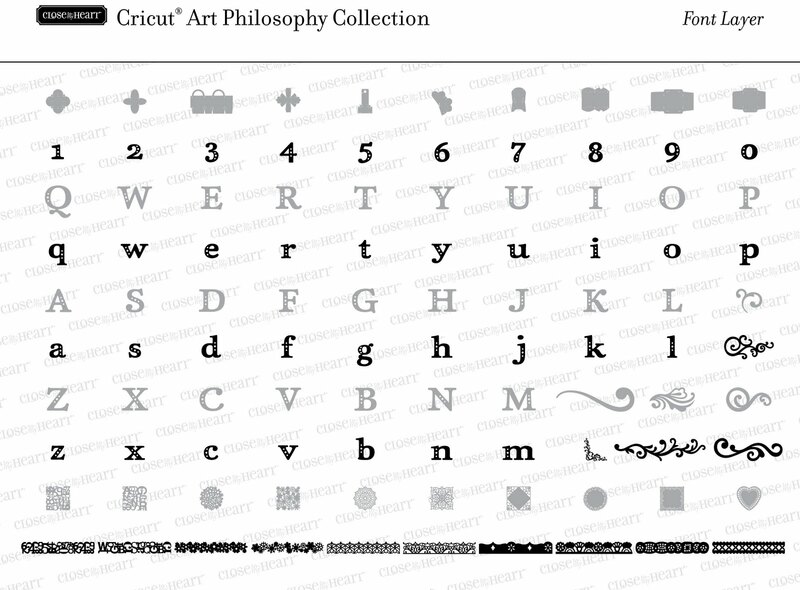 I know, I've posted about it before, Close to my Heart partnered with ProvoCraft & we now have an exclusive Cricut Cartridge Art Philosophy that coordinates with our stamps, has a font, does 3D items, etc., etc., etc. I have had a baby bug Cricut machine for a quite a while now. My wonderful hubby bought it for me for Christmas years ago. Anyway, I receive the Cricut newsletter emails and today's "Hello Thursday" email features our new cartridge!! Woohoo, so exciting! You can click thru and see so many wonderful things this cartridge can do. I will post the link in below. Cricut - Hello Thursday This takes you to the Cricut site. On the top left hand side of the page you will see a bookshelf with flowers on it and the Blue Cartridge case with Art Philosophy. Click on that and drool over all of the wonderful things it shows you can make. And that doesn't show you everything! I can't wait to open mine and start creating. But I'm thinking I really need to splurge and get the Expression! ;o) Let me know if you want to get your hands on this wonderful new cartridge. This is a video Corporate made which is a collection of just some of the fun had at Convention this year at Disneyland! I can be seen with my upline, Mandy and some of the Michigan ladies (Hope, Cyndi, Stephani, Me, Mandy, JuliAnne & Holly) from our team at about 30 seconds into the video. 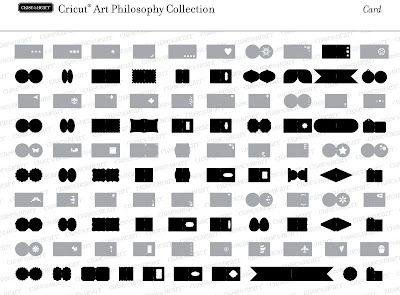 Here is a sneak peek at the wonderful new Cricut Cartridge collection available August 1st from Close to my Heart. I cannot wait to get mine so I can start playing & creating some of the beautiful items I saw at Convention! To order your collection in a few days go here.